One of the most romantic days of the year is fast approaching (that’s February 14th, in case you’ve forgotten!). But chances are, you’re either short on ideas for Valentine’s Day or you’ve not yet had the chance to plan anything elaborate. Don’t panic – we’re here to help with our guide to creating a romantic dinner setting for your loved one. From the lighting and the music to the food, we have a raft of inspiration at hand. So all you need to do is concentrate on not overcooking that steak. Remember – it’s not solely about pomp and ceremony either. The important thing is that whatever you’re planning comes from the heart. You can thank us later! “If music be the food of love…” Shakespeare famously declared. And he was right; music really can set the scene for a romantic dinner. But just be sure to adjust the volume accordingly. After all, there’s nothing worse than having to shout as you tuck into your starter! From the Bee Gees’ “How Deep Is Your Love” to Whitney Houston’s heart-soaring melody “I Will Always Love You”, there’s no shortage of love songs out there to choose from. In fact, a simple search on Youtube or Spotify will yield plenty of results if you’re short on inspiration. But it’s also important to consider what’s meaningful to you and your partner specifically. Just because a song contains the word ‘love’ doesn’t necessarily mean it’s romantic, as lovely as it might sound. Think about the type of music your partner likes, or the artists and albums you enjoy listening to together. Are there any songs that hold a special connection to you as a couple? 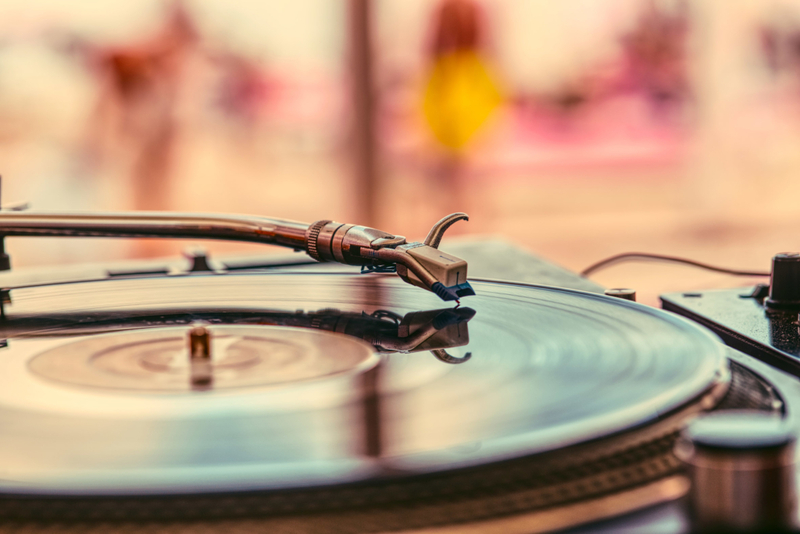 Consider the first dance at your wedding or the song that was playing in the background on your first date. You could even add these to a personalised playlist for you both to return to time and time again. Whether you plan to eat in the dining room, living room or kitchen, lighting is a key consideration for romantic dining. Quite frankly, there’s nothing intimate about stark, strip or bare lighting on Valentine’s Day. So try to dim the lights, if possible, or rely on lamps instead. Low-hanging pendant lighting could also help to cast a sentimental light on your dinner. However, that’s if you’re happy with what you’ve cooked. Dining by candlelight is also imbued with romantic connotations, not least because it can evoke a sense of intimacy and sensuality. For extra romance points, opt for scented candles. Fragrances like patchouli and rosewood are thought to have aphrodisiac qualities. 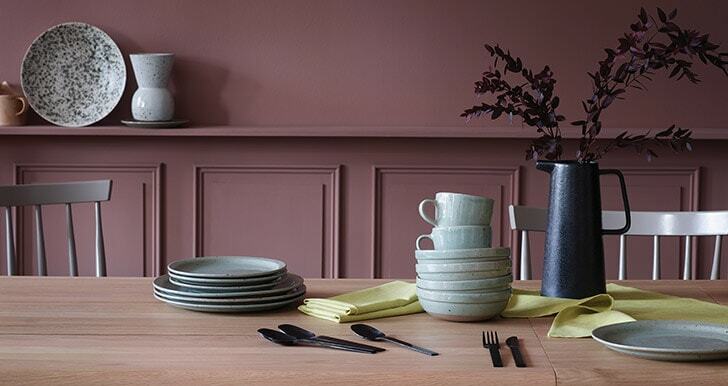 Setting your table in advance with some attention to detail, can certainly help to amplify the mood. Of course, it’s practical, too! Many restaurants choose to set a romantic dinner scene with personal details such as hand-written menus and hand-thrown pottery. Some eateries also choose colour schemes that tie in with the menu or decor of the restaurant. Think about what kind of romantic dinner atmosphere you’re hoping to create, and the dishes you’ll be cooking. If you’re rustling up some sensational seafood, could you bring an element of the coast to your table, such as place names written on stones and pebbles? Or you could opt for pink hues, perhaps using rose gold cutlery and pink and grey plates and napkins, for a more romantic theme? Habitat is a great starting point if you’re looking to update your tableware. Giving and receiving flowers has long been seen as a loving gesture for Valentine’s Day, and for many, it doesn’t get more romantic than roses. But these fragrant blooms are not the only flowers steeped in symbolism. White daisies, red tulips, sunflowers and asters are all thought to represent romance and unity, so why not try making your own bespoke arrangement? Or, have a rummage in the garden and place a vase of freshly cut stems in the centre of your dining table for a rustic centrepiece. If you’re not the green-fingered type, you could always commission a florist to put together a stunning arrangement for your romantic dinner. 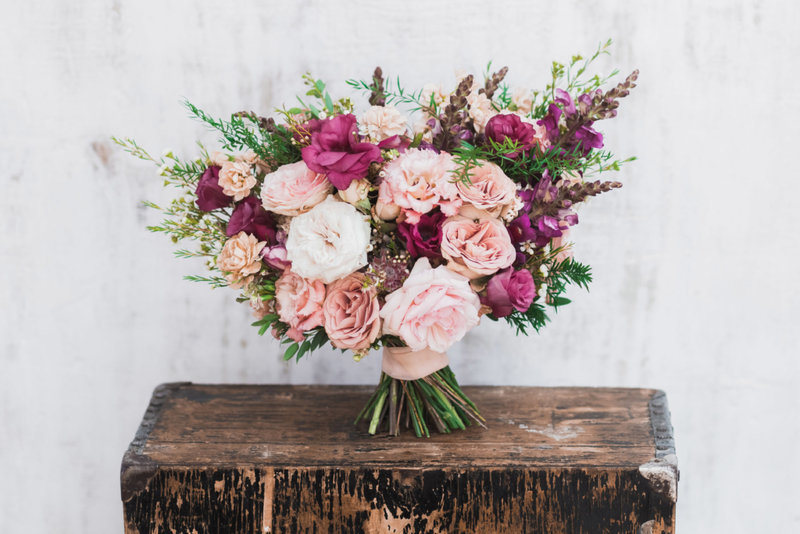 Conveniently, flowers-by-post service Bloom & Wild offer same-day delivery for London orders and free next day nationwide delivery if you’ve overlooked the petals in all of your preparations. Depending on your culinary prowess, you could prepare a three-, five-, or even seven-course meal if you’re looking to impress. 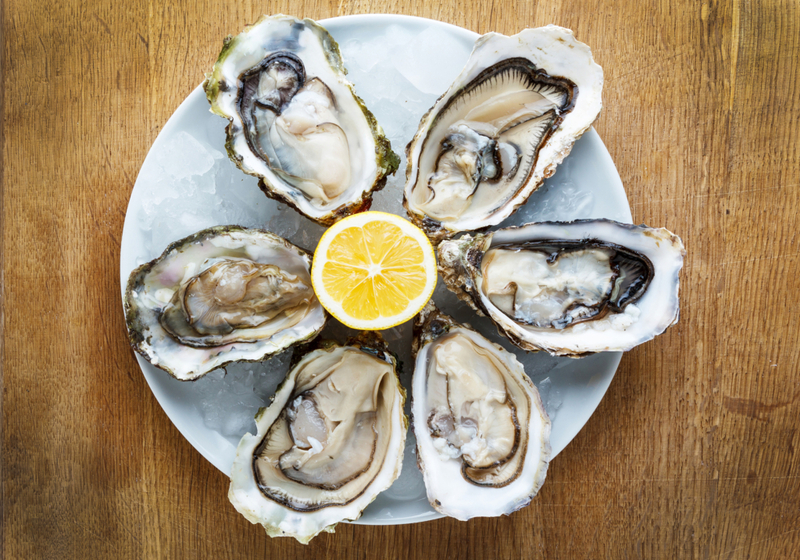 Oysters, steak and lobster and are all typically romantic dinner dishes, but you don’t have to stick to these alone. Often, the most meaningful gestures are the simplest, such as cooking your partner’s favourite dish. It makes absolutely no difference what it is. So, expect to cook up anything from a large dish of bubbling hot mac’n’cheese to or a burger stacked high with plenty of toppings in a toasted brioche bun. You could also bring an extra touch of romance to the table by cooking with more decadent ingredients, such as truffle, caviar, champagne. Also, why not look out for edibles that are deemed to have aphrodisiac qualities, such as asparagus, avocado, chilli and chocolate? If you’re still stuck for romantic dinner ideas, sharing dishes are a great option. We’re not suggesting you slurp on the same piece of spaghetti a la Disney’s Lady & The Tramp. However, a sharing platter of charcuterie or seafood can be a fun way to kick off the meal. Just don’t hog the best bits! 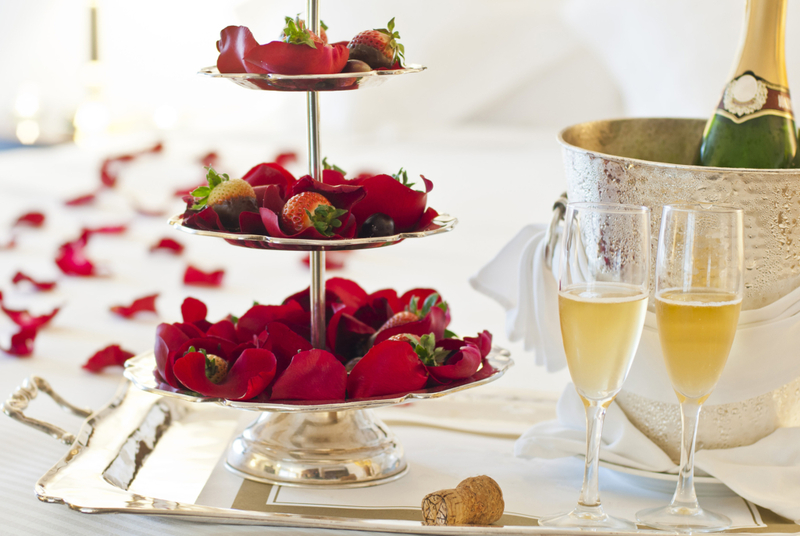 While a glass or two of champagne will never go amiss on Valentine’s Day, there are other alternatives if it’s not quite to your liking. Italian sparkling wine, Prosecco, continues to be popular, while the UK is now also producing some exquisite sparkling wines, too. If you’re feeling particularly romantic, you could also look for a wine that was bottled the year you met or were married and save the cork as a memento. If your other half’s preferred drink is a pint of beer, have some chilled in the fridge and ready to open. Just save the bubbles for yourself! If you’re planning to entertain with a romantic dinner for two in your kitchen diner but you’ve realised it looks like it needs a refresh, check out our blog post on How to choose kitchen cabinets. Then this time next year, you’ll have a gorgeous new kitchen to wine and dine in to your heart’s content.